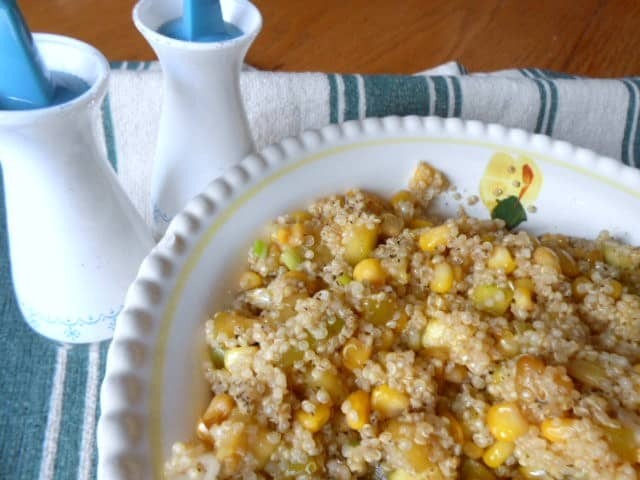 As promised, I bring to you another recipe with the wonderful quinoa as one of the main ingredients. 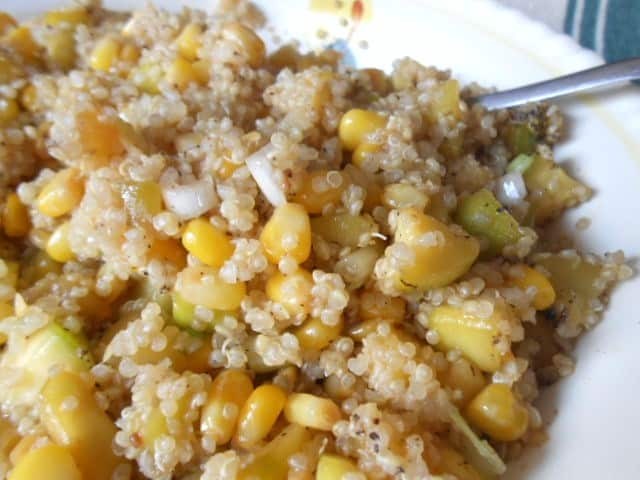 If you didn’t get a chance to read one of my prior posts about quinoa, check out how good it is for you HERE. 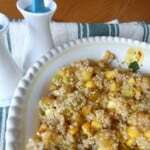 I found this recipe for Quinoa, Zucchini and Corn in Lemon Butter from a site I’ve mentioned before called LaaLoosh. 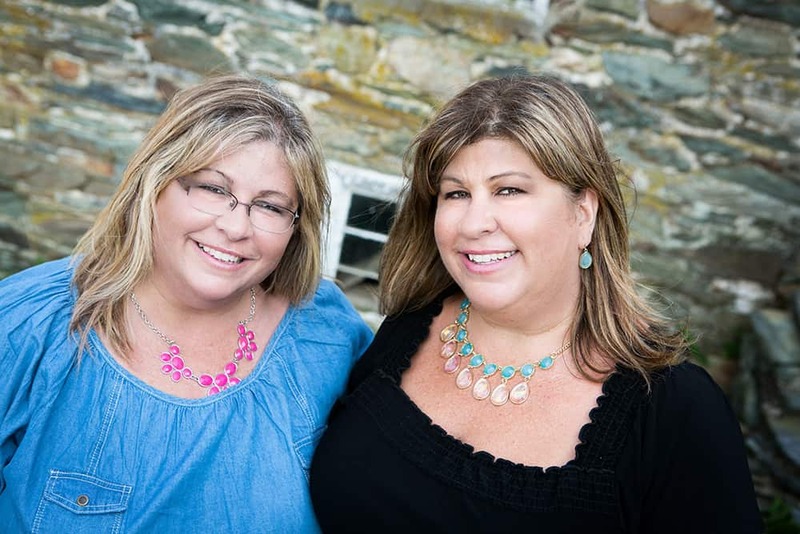 LOVE this site because all of her recipes come with the nutritional information, as well as the Weight Watchers Points Plus Values. If you’re looking for easy, healthy recipes, her site is one of the best in my opinion. Place a medium sized skillet over medium high heat, melt butter in it, and then add in zucchini and garlic. Cook until zucchini is tender, about 3 to 5 minutes. Then add in corn and honey and cook until heated through. 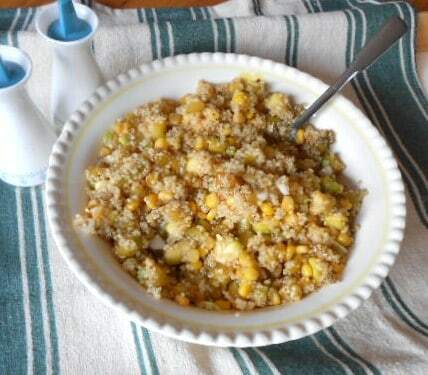 Add the corn and zucchini to the quinoa, along with the scallions and lemon juice and toss to combine. The above picture is the entire recipe. That doesn’t mean I ate it all in one sitting, but I probably could have! It was so tasty! The zucchini actually almost tastes fruity because of the lemon and honey. The garlic and scallions add in that hearty component. I just can’t get enough of quinoa these days. This recipe, per serving has 3 grams of protein and 3 grams of fiber and only 20 grams of carbs. A great choice as a side dish, to add to a salad, or just to eat all by itself, like I did. Can’t wait to go upstairs and heat me up some leftovers! That’s the best part about posting these recipes. I get to eat them too. 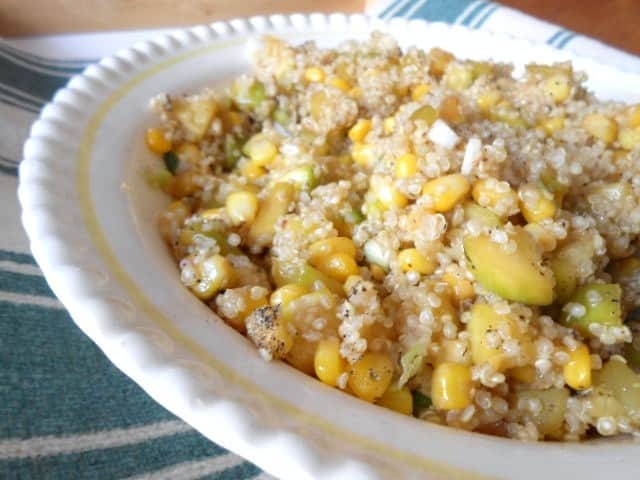 So if you haven’t tried quinoa yet, now I have provided you with 2 recipes that have quinoa as an ingredient. What’cha waitin’ for?! Go get you some and try it for yourself. Don’t be shy. Just jump right onto the quinoa bandwagon! I have to try it–sounds yummy and it only takes 15 minutes to make??!! Yup! 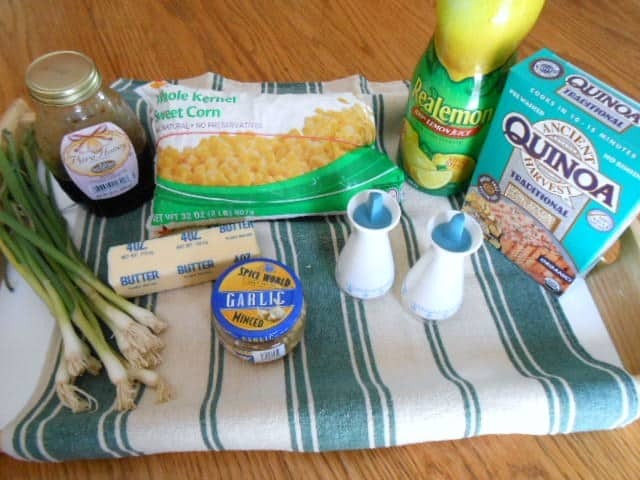 It’s very easy to make and keeps well in the refrigerator. The recipe doesn’t say how much butter. Hi Erin, Thanks for catching that! It’s 2 tablespoons of butter. I’ve added it to the recipe.